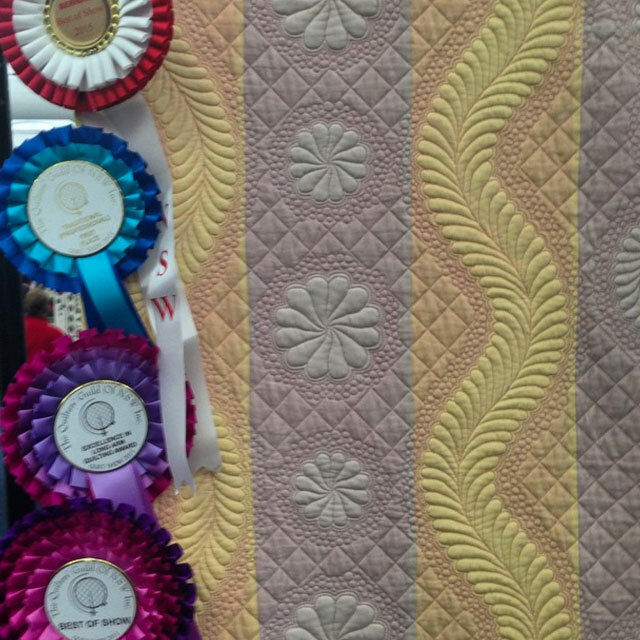 Make sure not to miss the Friday Showcase in the Guild office at 10am on 3 July when representatives from Fairholme Quilters will be presenting their quilts and talking about the group. 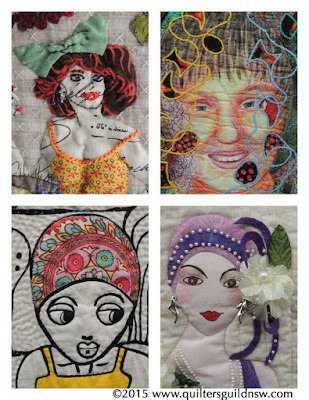 Fairholme Quilters have been meeting in northern Sydney since 1984. Our membership represents a range of quilting skills, experience and styles, that are showcased every two years in a community exhibition (the next one is scheduled for 8 - 10th April 2016). We run a regular program of making quilts for a number of local community causes, and in response to emergencies, donating about 50 quilts each year. In a group so long established, friendship is an important result of regular contact and activities, and collaboration frequent. 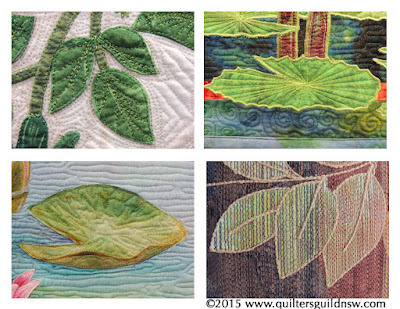 Workshops and occasional speakers keep up us up-to-date and learning about many aspects of quilting practice both locally and more broadly. We welcome enquiries from prospective new members. 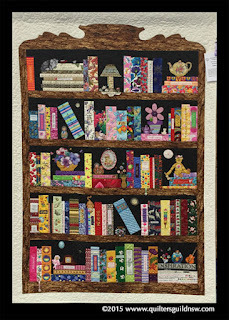 Fairholme Quilters won third prize in the Group/Collaborative category at the Sydney Quilt Show 2015 and they have many other wonderful quilts to share with you. 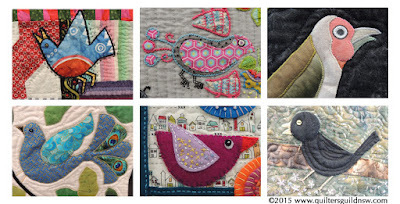 For Guild members only: Join Robyn Shipton, and other Guild members, in her new "local" shop in the next of these fun sewing days. There are a few places available. Robyn Evans is opening her workshop room for us. Level 4, 1 Mona Vale Rd, Mona Vale. There is paid parking under the building, or street parking (various time limits apply) or the free parking nearby in Kitchener Park. Bring your own project or pick up something new from the shop. Robyn has up to 5 machines available or do hand work. There will be morning tea provided and there are plenty of good options for lunch nearby. Lucky Door Prize and this is all FREE for Guild members. Please to book in call the office 9283-3737 or Robyn Shipton 0412-314-754. REMINDER: Join the Guild or renew your membership today! THANK YOU! 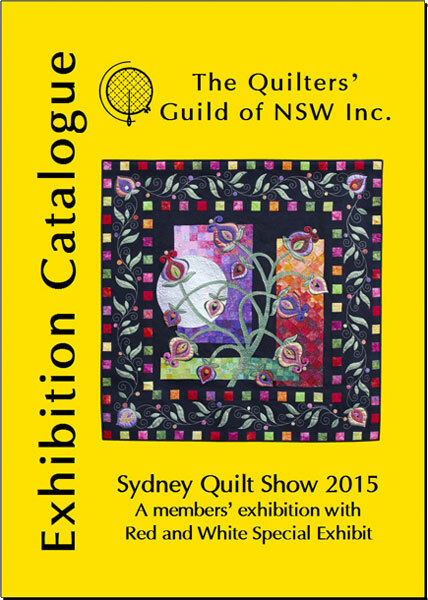 to all of the Sydney Quilt Show 2015 Sponsors. Their generosity and support are much appreciated. Please support them in return. 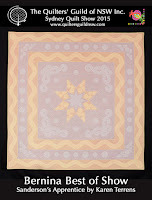 Images of all prize winning quilts can be viewed in the Sydney Quilt Show Prize Winners Gallery. Clockwise from top left: Everything but the Kitchen Sink by Trish Bloomfield; The Symphonic Buzz Band by Denise Aubin; The Cabinet by Di Tramontana; Beyond the Garden Wall by Irene Harris; Oh Christmas Tree by Wendy Williams; and Peacock Garden by Leonie Lever. 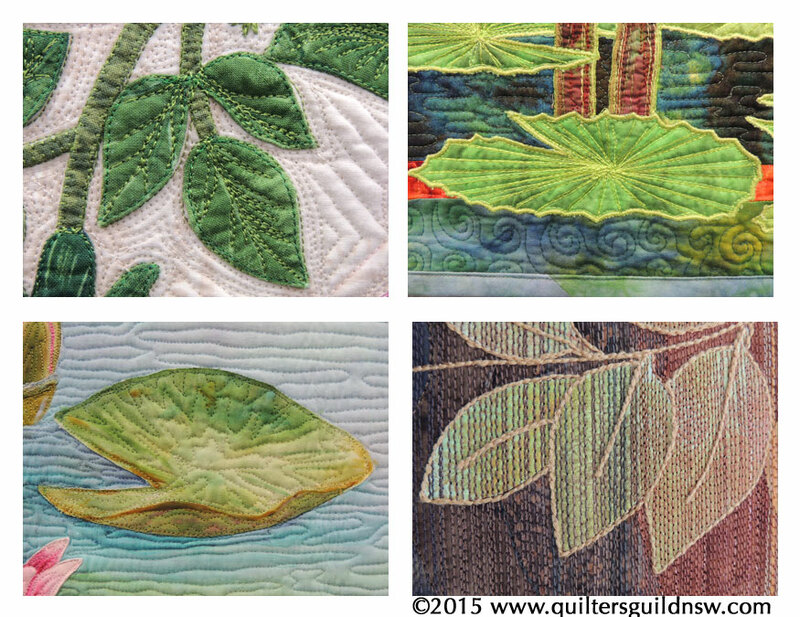 A small glimpse of some of the wonderful quilts on exhibition at the Sydney Quilt Show 2015. Clockwise from top left: Magnificent Cordyline by Sandy Corry; In the Gum Tree Garden by Amanda Daly; Old Wall by Sue Dennis; and Everything Old is New Again by Jenny Rofe. 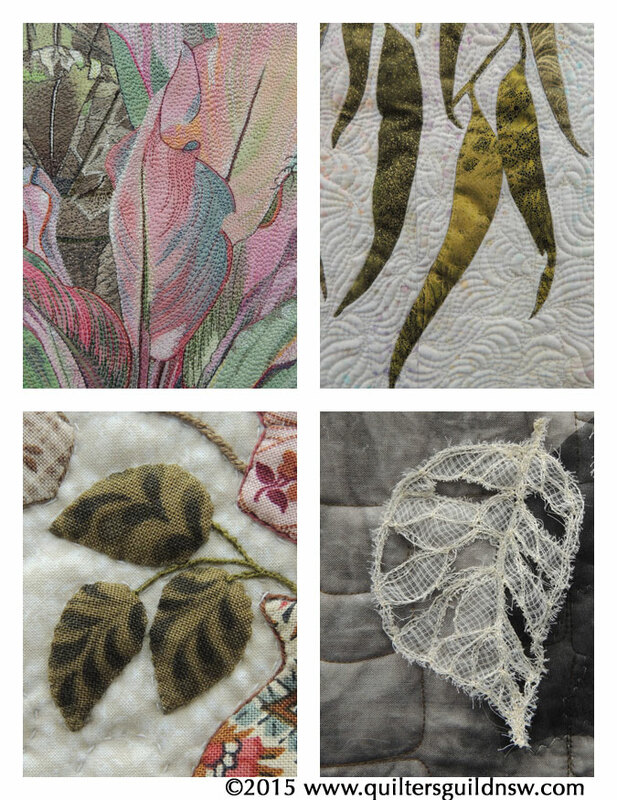 Clockwise from top left: Lily Rose by Esther Aliu; Habitat by Julie Harding; Four Seasons by Mary Williams; and The Lily Pond by Bernardine Hine. 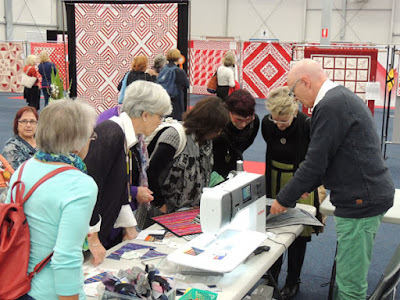 Sydney Quilt Show 2015: People You May See! The Guild invites you to join Bernina Best of Show Prize Winner Karen Terrens in the Best of Show area from 11 am - 12 then again 1.30 - 2.30pm on Saturday 20 June. All welcome! KidSkills is a free activity aimed at introducing to the delights of colour, fabric and block designs. Saturday and Sunday: 10am-12 noon and 1-3pm. 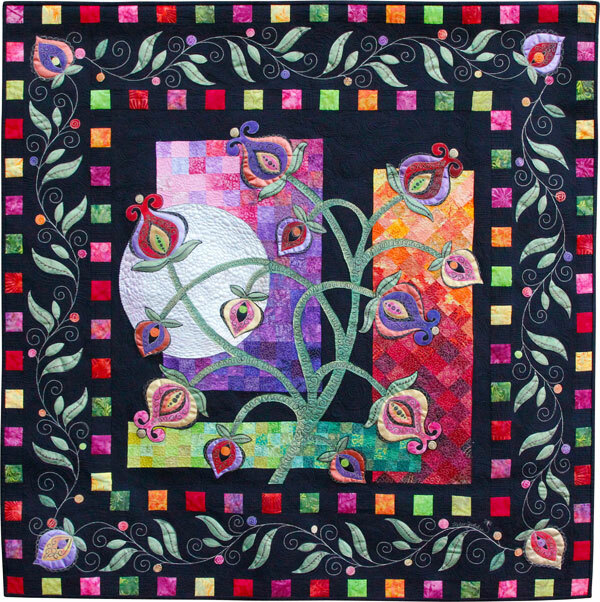 Hand Applique with Lois Cook. 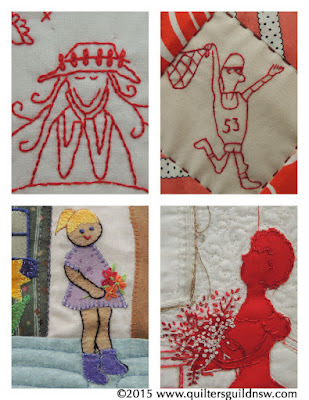 Clockwise from top left: Symphony by Wailyn Mar (inspired by Annie Downs); Red Dilemma by Catherine Babidge; Red Silhouette by Denise Sargo; and Purple Houses by Patricia Poole. Clockwise from top left: A Market in Provence by Denise Aubin; Enmeshed in the Fabric of Life by Judi Nikoleski; An Australian Fashion by Joy Crowe; and Everything but the Kitchen Sink by Trish Bloomfield. a demonstration timetable including a line up of several Guild accredited teachers. 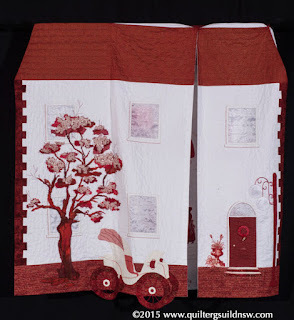 Paper Piecing with Lynn Hewitt. Come along; see how it's done and talk to the experts! 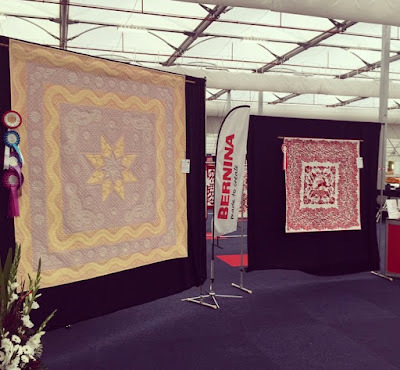 Talking of experts, you have to opportunity to meet with Bernina Best of Show Prize Winner Karen Terrens in the Best of Show area from 11 am - 12 then again 1.30 - 2.30pm on Friday 19 June and Saturday 20 June. All welcome! The Sydney Quilt Show opens today and runs until Sunday 21 June (9am to 4.30pm) at the Exhibition Centre at Glebe Island. You can get to the show by free bus or ferry - see transport information. Congratulations to Karen Terrens who was awarded Bernina Best of Show, along with other prizes, at the Sydney Quilt Show 2014 for her masterpiece Sanderson's Apprentice. Here is an image that you are welcome to copy and share. 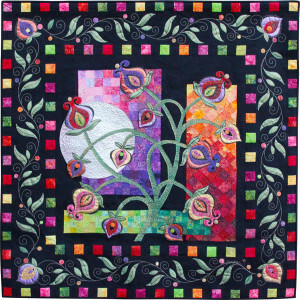 Be sure to link back to the Sydney Quilt Show Prizewinner's Gallery which features images of all of the prize winning quilts. Thank you to ALL Guild members who have entered the Sydney Quilt Show to provide an inspiring display. If you can't make it to the show in person, follow and share the fun and colour of sydneyquiltshow2015 on Instagram. 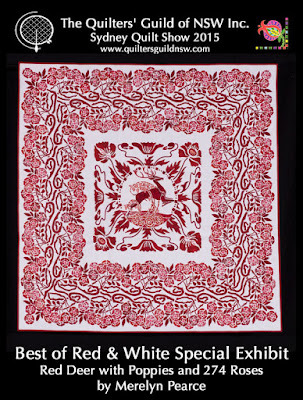 Quiltshow photography policy: Please respect our members' copyright. 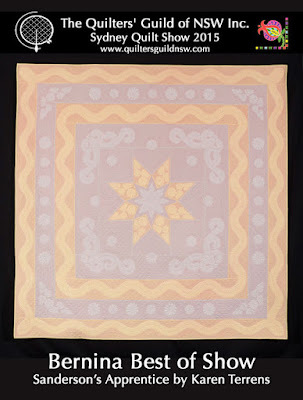 Quilt photography is permitted for personal use only Images must not be published online or in other media unless you have the consent of the relevant quiltmaker. If you wish to photograph and publish for commercial purposes, please apply to the membership desk for special permission. 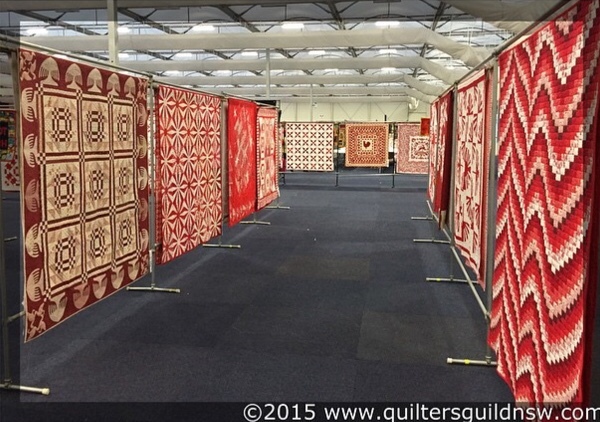 Join us for day 1 of the Sydney Quilt Show 2015 (9am - 4.30pm). 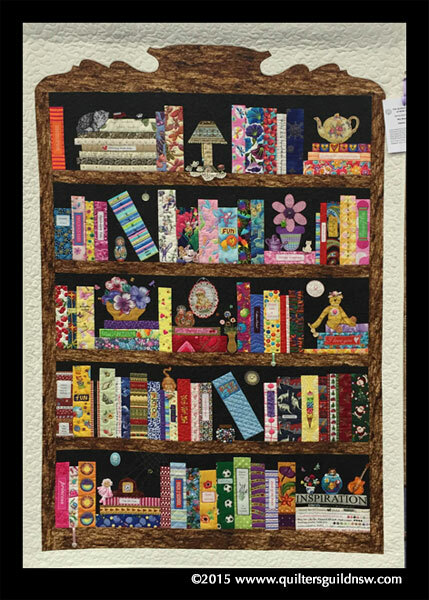 The awards ceremony starts at 11am and the comprehensive gallery of prize winning quilts will be posted online soon after. In the meantime, here's a little red and white magic to get you warmed up. 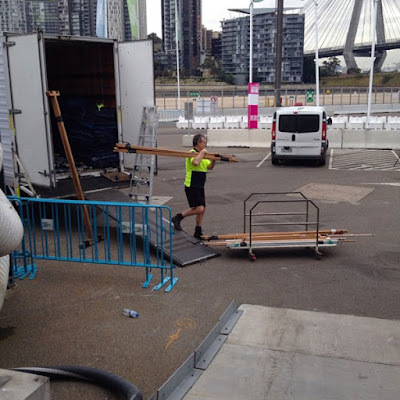 Staging a quilt show is a significant logistical exercise. 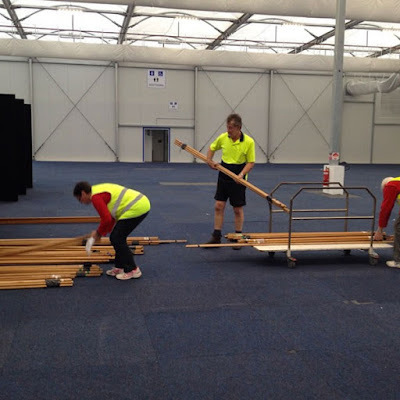 As this post goes to air, more than 60 Guild volunteers will be at the Exhibition Centre at Glebe Island setting up frames; hanging HUNDREDS of quilts; and generally getting ready for opening day on Wednesday 17 June. Thank you to all the volunteers for their time, energy and enthusiasm. 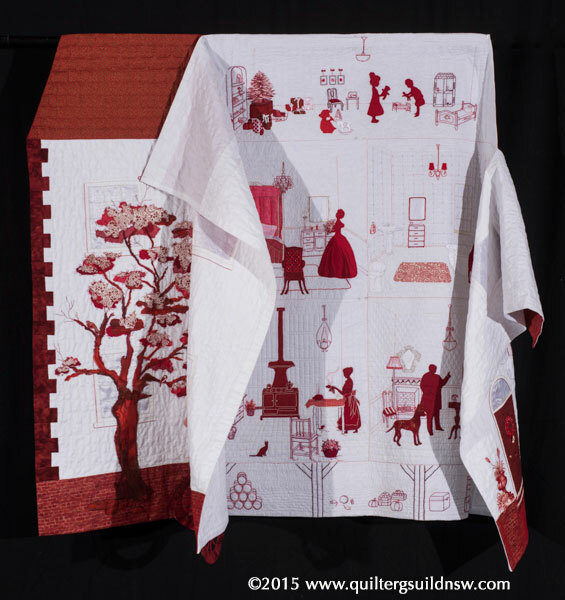 And remember, you can follow the colour and action of @sydneyquiltshow2015 on Instagram and add your own contribution with the hash tag #sydneyquiltshow2015. To all Guild Members, please ensure that all raffle ticket monies or unused raffle tickets are either returned to the Guild office by Friday, 12 June or handed over to the membership desk at the Sydney Quilt Show prior to the draw at 4.00pm Sunday 21 June 2015. 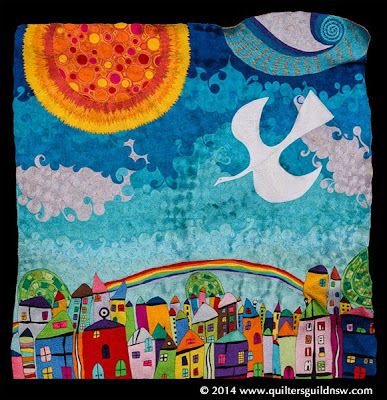 Follow and share the fun and colour of sydneyquiltshow2015 on Instagram and don't forget the hashtag #sydneyquiltshow2015 on your social media posts. Wednesday, 10 June 2015 is the final deadline for delivery of quilts for the Sydney Quilt Show 2015. Is the identifying label securely sewn on the back and covered with a piece of calico/fabric? 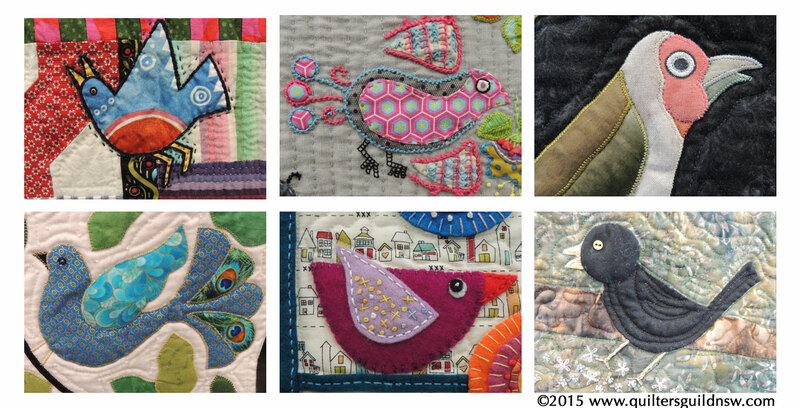 There are over 430 quilts entered into the Sydney Quilt Show 2015. See them all next week from 17-21 June 2015!